This week we have a guest post by Albany resident Nicholas Carman. The Bike Friendly crew have ridden around this area plenty of times, visited the playground and the skatepark, never realising a great bike-path was hiding a stone’s throw away. Thanks for sharing this hidden gem with us Nicholas! A scenic section winding it’s way behind the Albany Tennis Park. My family and I moved to Albany in mid 2013 and it wasn’t long before I began looking speculatively at my old mountain bike which had been resting unloved in my parents basement for the last ten years. After I took it along to a nearby bike shop and revived it I started looking around for places to ride. I was straight away drawn to the green area in front of Mitre 10 Mega on Oteha Valley Rd. 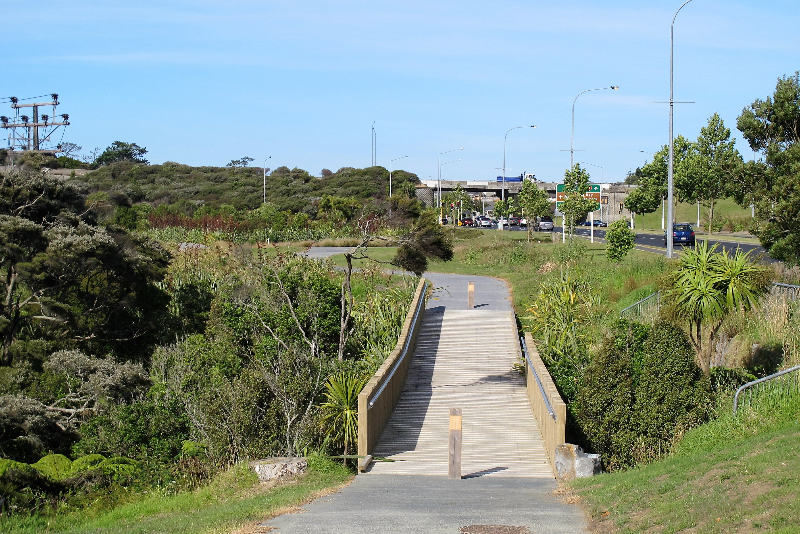 Hooton Reserve looked to have been made by the old North Shore City Council and consisted of a playground and a bike-trail that stretched from the motorway almost all the way to Albany Village. Almost, because it stopped short at the stream before Gills Road, as if the council had run out of money to complete the project. The beginning of the trail at Gill’s Rd, close to Albany Village. I intended to write to the local board to suggest that they ought to finish the trail so that it ran all the way to Albany, but somebody beat me to the punch. Over the winter and spring of 2015 a crew came in and built the bridge and finished the path all the way to Gills Rd. The completed path offers walkers and riders a car-free route all the way from the motorway to Albany Village. I use it to take my son to the Albany Library when the weather is good. 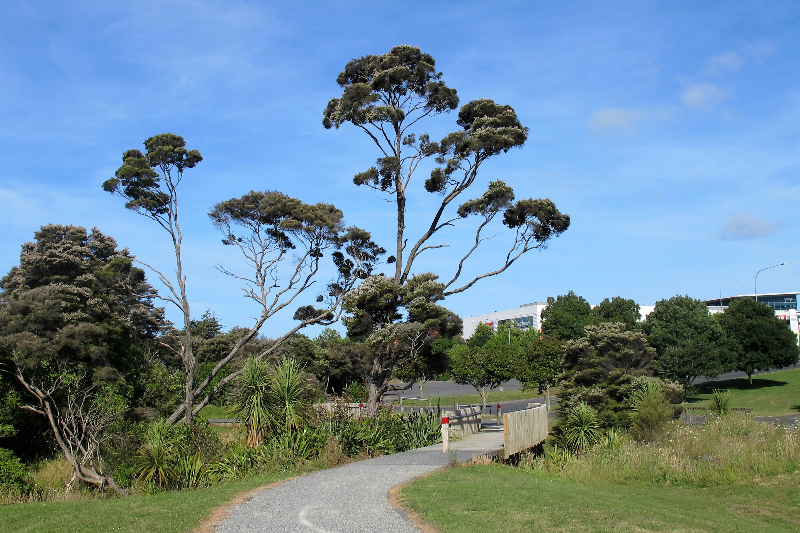 It also helps connect walkers and riders to the Kell Park reserve behind the library. This path can be found starting next to the northbound on-ramp at Oteha Valley Rd, or at the other end from the northern side of Albany Village, by turning down Gills Rd. The trail ends here with a looped section as it meets the Northern Motorway. The path begins at the Oteha Valley end with a funny little loop around a stormwater pond (one of the leftovers which the recent improvements has connected up). It crosses a bridge and then descends into the park, running alongside the stream. The path is mostly crushed white stone, with concrete on some downhill sections. It’s ideal for families as it is all off-road and mostly flat. 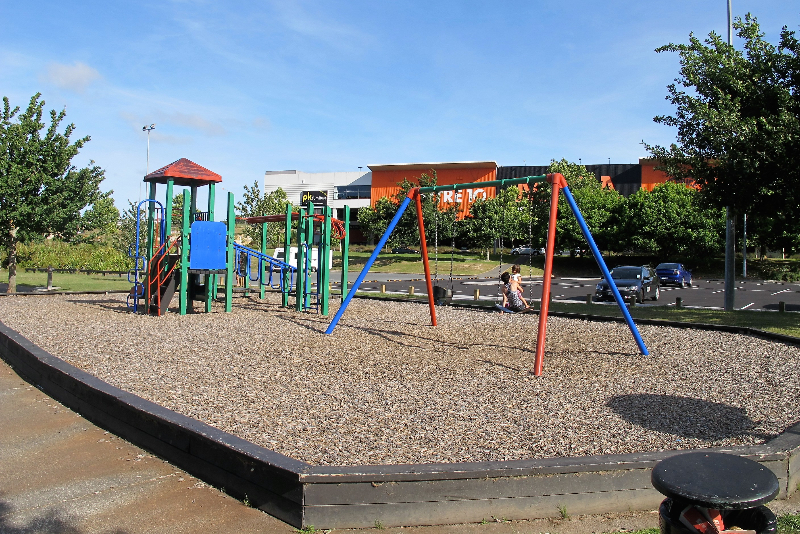 There’s also a playground in the middle, in front of Mitre 10 Mega if the kids need a break. The only place you will encounter cars on the path is in front of the Kawai Purapura yoga retreat. Visitors occasionally drive their cars in and out of the retreat, but the intersection is signposted, and traffic is sparse. For visitors from outside Albany I would suggest a good place to start would be the kids playground in the middle. You could ride into Albany and visit the library, and buy a coffee or ice cream at the shops. Or you could park in Albany and ride to the motorway and back. I recommend Hooton Reserve to you as a green and pleasant place to take your family riding, or if you live in Albany, it makes an excellent car-free shortcut to the shops. 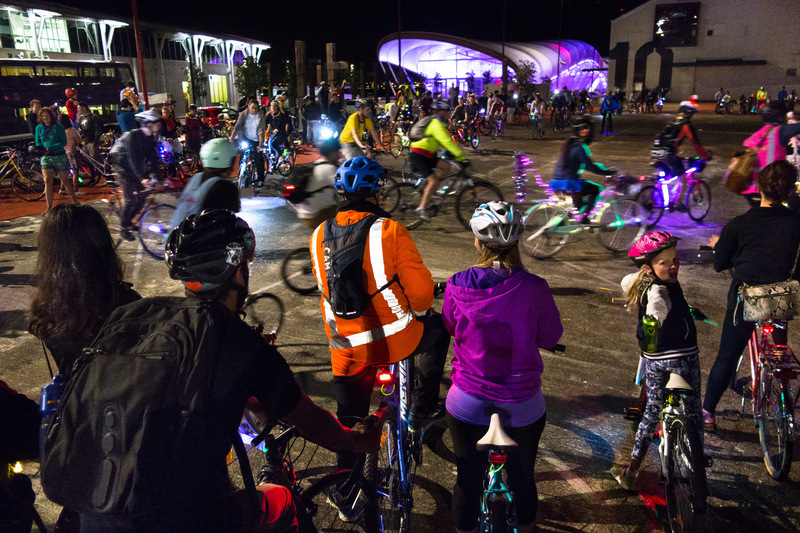 Join the Bike Ravers this Valentines Night for a summery sundown ride. 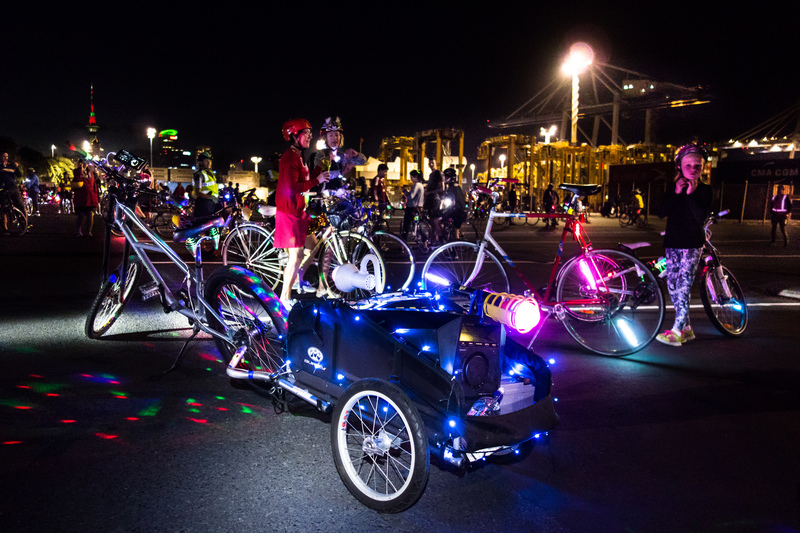 As we’ve documented previously Bike Raves are FUN, FUN, FUN. Come along to Mission Bay at 8pm for an 8.20 take-off by the fountain. As always, bring lights and sounds. The theme is “Date Night”. 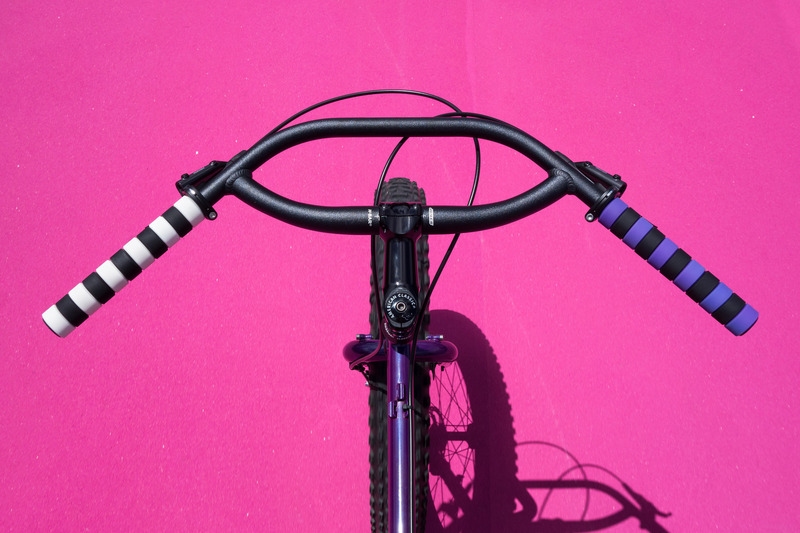 Dress your bike in red and pink. They’ll be posting a Spotify playlist (appropriately themed!) for the ride closer to the time on the Facebook Event Page. For old people like me the Spotify thing works like this: You subscribe to Spotify Premium on your smartphone (free with a lot of Spark plans, even pre-pay). That enables you to download the playlist songs onto your phone when you are connected via wifi (no mobile data charges). Then when everyone presses play (at the same time) on the night the music is synced between everyone’s portable bluetooth speakers. I think that’s how it works! As always Bike Rave is a FREE EVENT!!! 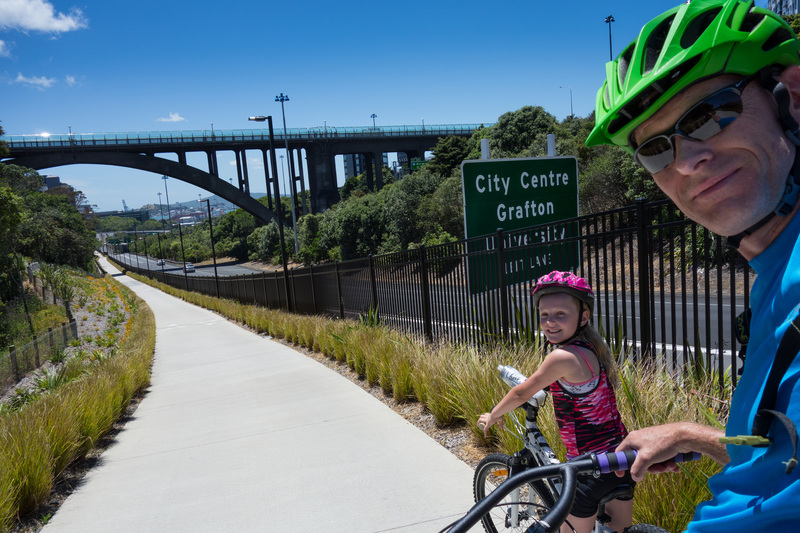 Jump on your bike for Go-By-Bike-Day at Smales Farm on Wednesday 10 February for the annual Go-By-Bike-Day Picnic, 11am – 2pm. Bring your bike to Smales Farm’s Food Truck Picnic for a free Bike Dr cycle tune-up or your helmet for a free coffee and to win spot prizes. 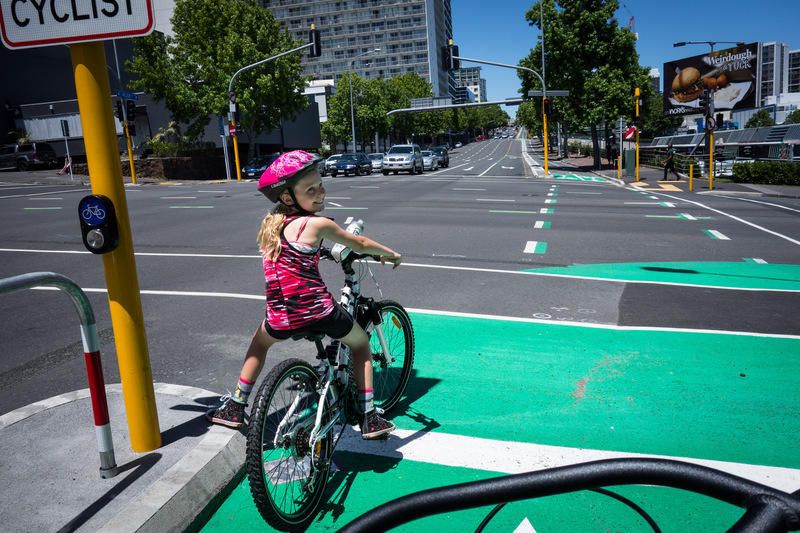 Over the Christmas break I cycled around Central Auckland on several occasions, and if you haven’t done that recently, let me tell you, times have changed! 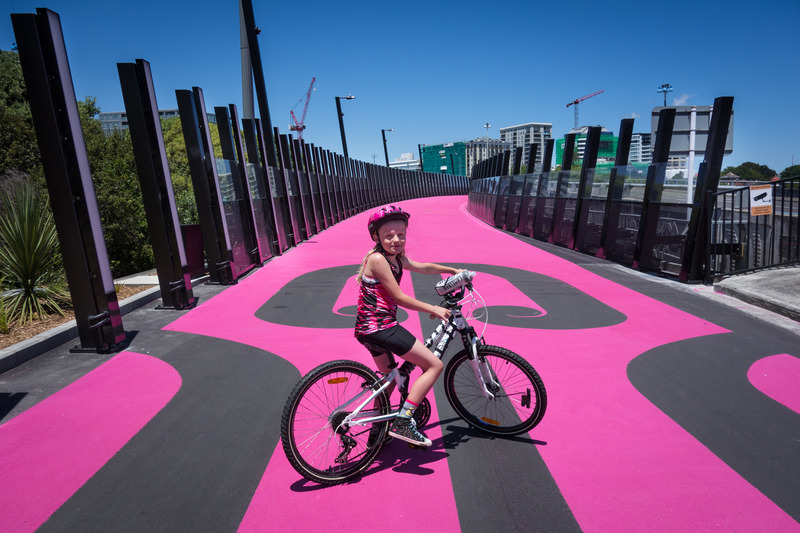 Not that long ago I would never have considered riding in the city with a nine year old at my side, but by sticking to cycleways (and the odd footpath) you can now loop around the entire CBD without coming near a car. Check-out the cycle-network map below and you’ll see what I mean. Coming from the North Shore I was starting to feel a little neglected on these rides as there’s a LOT of money being spent on bike-infrastructure on that side of the bridge. 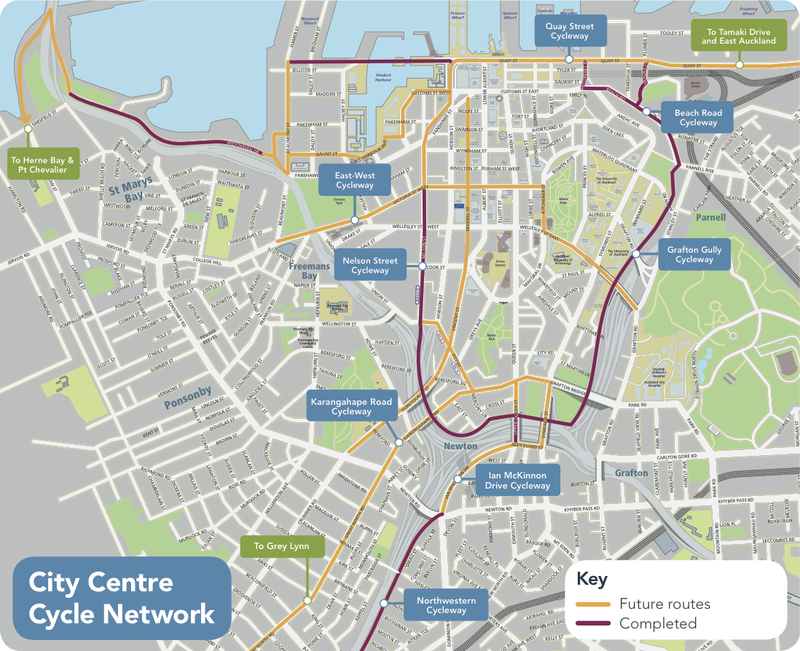 I’ve spoken to the folks at Auckland Transport and the idea is to improve cycling-connections in a 5km radius of Downtown before tackling the suburbs. I hope they stick to that promise, because as you ride around the city you WILL become envious, that strip-of-paint down Lake Road is not cutting the mustard anymore! Anyway, with 200 million being invested in cycling within the Auckland region (over the next three years), I’m sure we’ll see some improvements on our side of the bridge… Eventually. Because the ferry is so expensive (and a long ride from home), on these jaunts I usually chuck the bikes in the back of my car, drive over the bridge and start cycling from Herne Bay or Point Erin (after nabbing a free park). From there it’s a delightful ride into Downtown either under the harbour bridge and along (the fantastic) Westhaven Promenade, or stay on the western side of the motorway and ride the path behind that large perspex sound-barrier (accessed in a couple of places from behind the Point Erin Pools). That will take you directly to Jacob’s Ladder Footbridge (where you can cross the motorway to Westhaven), or continue to Victoria Park. You could start your ride at the top of the city on Upper Queen St, but I reckon when riding a loop it’s best to get the uphill part out of the way first. That way little legs end-up sailing downhill towards a waterfront ice-cream on the return leg. Phycology never to be underestimated when planning a family bike ride! The Nelson Street Cycleway will eventually continue right down to the Viaduct, but for now it peters-out at the Nelson St/Victoria St West intersection. From there you ride up to Lightpath on a totally separated two-way cyclelane, a real grown-up one like you might see in Denmark or the Netherlands. Northern entrance to Lightpath. 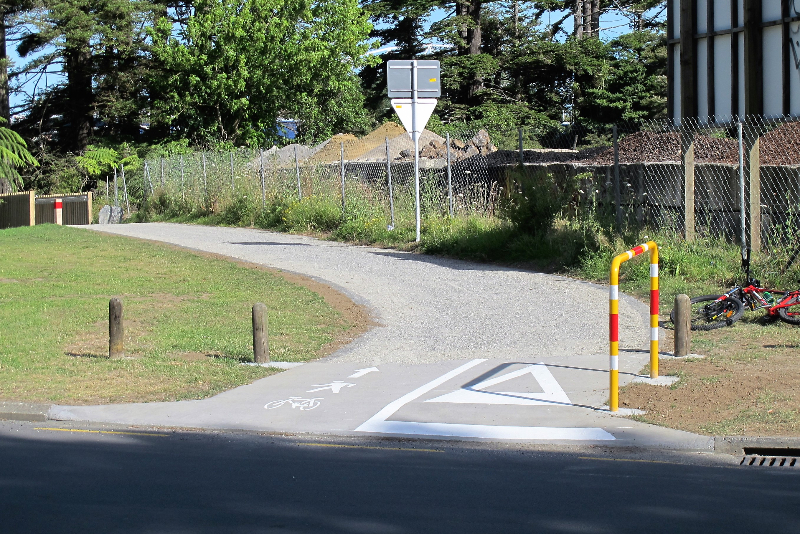 Do bike-paths get more blingtastic? Nelson St was once a one-way, multi-lane, high-speed hellhole, funnelling tin-tops at breakneck speeds from Union St to the waterfront. It kind of still is, but cunning (brave?) transport engineers have taken a lane away from vehicular traffic and created a safe-haven for bikes. The cycle-lane is separated from the traffic with a concrete strip, but you still have to pay attention near the bottom as there are openings for vehicles to access businesses on the Northern side. Most of you will feel totally comfortable riding up there with your kids, there’s even bike-specific “leaning-posts” and crossing-buttons at the intersections. Little-Johnnys with impulsive flight-reflexes are probably best left at home though, you are after all surrounded by many child-squashing opportunities in the city. It’s a fairly gentle uphill cruise on this separated path and then as you hit Union St the Lightpath entrance comes into view, a stones’s throw from that massive pohutukawa sculpture by the Southern Motorway on-ramp. Lightpath is a “statement”, and it’s a clever statement. 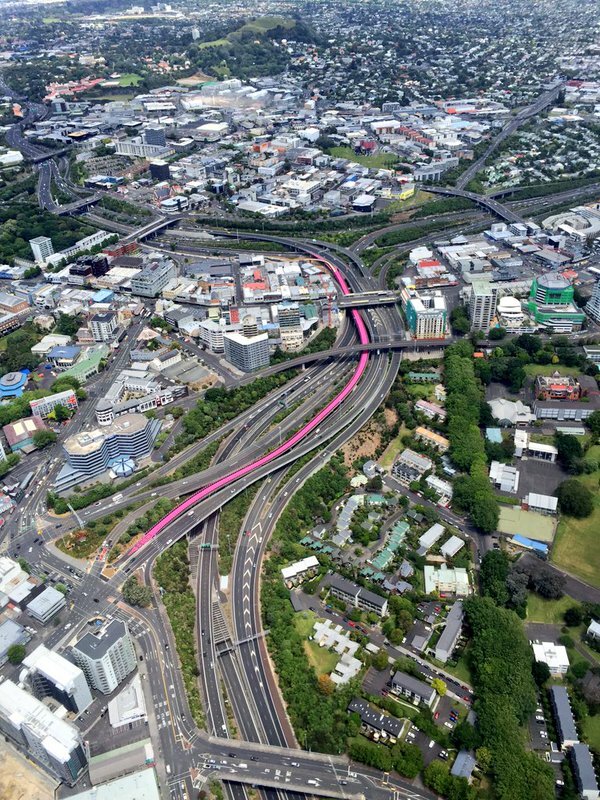 Utilising a mothballed onramp, for 700m it encircles the back of the city, curving around Karangahape Rd to Canada St. With proper funding available the designers went to town and the whole project has a quality feel to it. Look beyond the retina-searing pink surface and you’ll notice the angled safety barriers, the glass screens, Māori motifs and funky lighting-towers. The barrier posts themselves incorporate computer-controlled LED panels. 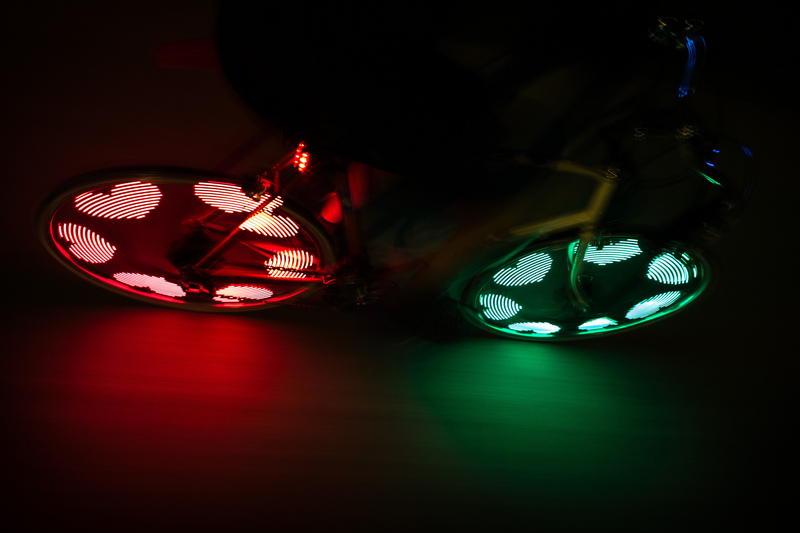 Much like the Sky Tower, artists or lighting-designers can program these in any combination of colours they desire. As you gain elevation towards Spaghetti Junction you end up looking down on lanes of car traffic, never a bad thing. There’s concrete and steel snaking in all directions, but because the glass barriers deflect the majority of noise it’s quite a tranquil ride. Eventually the pink path transitions to a slightly narrower boardwalkie affair (the benefit of being a blogger means I can make-up words like boardwalkie) that hugs the commercial buildings as you wend your way around to Canada St. The path proper ends here, but exits onto a wide share-with-care footpath that leads you to Upper Queen St. Turn left for Karangahape Rd, right to access the Northwestern Cycleway or head straight across the road and you’ll find the Grafton Gully Cycleway. I should save that last one for another post, as it’s really quite impressive. 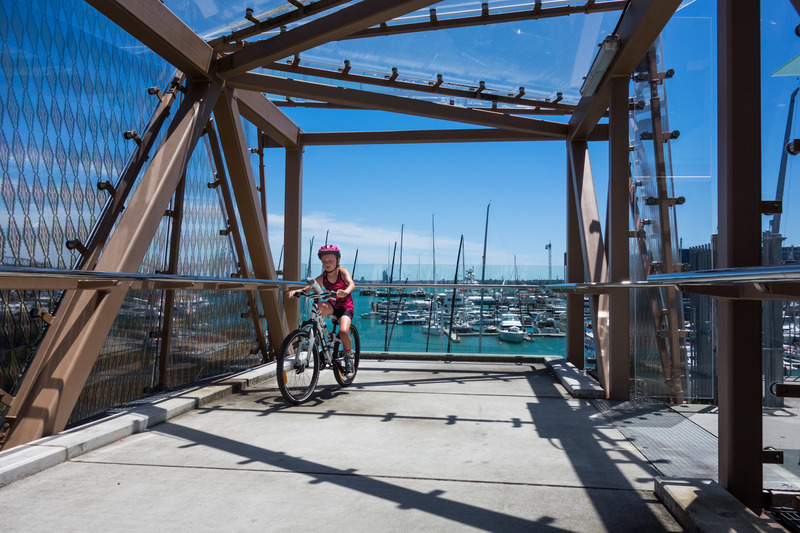 A bicycle-motorway that will carry you all the way down to Beach Rd, a stone’s throw from the waterfront. These investments in bicycle-infrastructure sure make getting around the city easier, long may they continue! 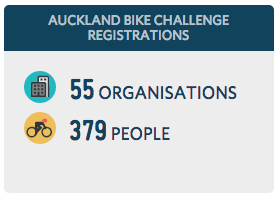 Register you and/or your workplace team for the Auckland Bike Challenge at www.lovetoride.net/auckland and compete for spot prizes during the entire month. 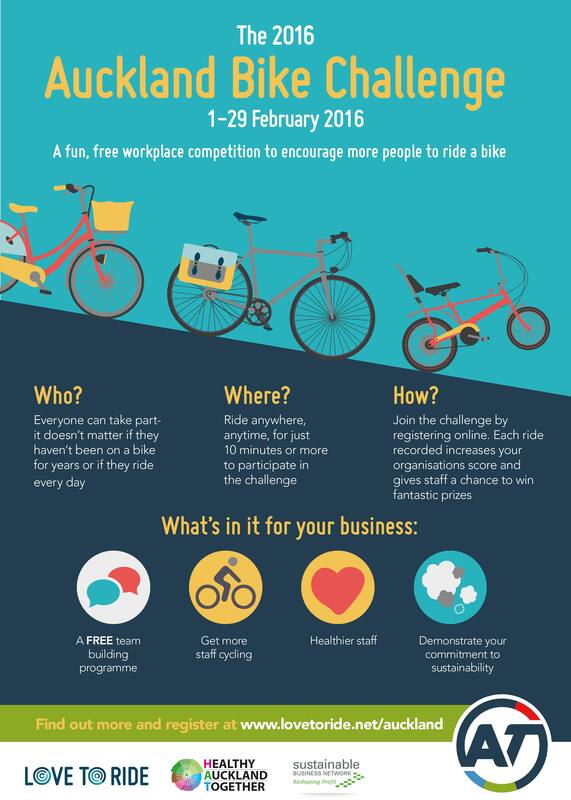 This fun, online event is designed to encourage cycling, teamwork and good health. I’ve participated in this type of challenge previously when it was aimed more at individual commuters. It was fun seeing my rides and kilometres adding-up, and even as a regular rider I was motivated to ride more than I normally would! Costume of the night, I reckon. So simple! 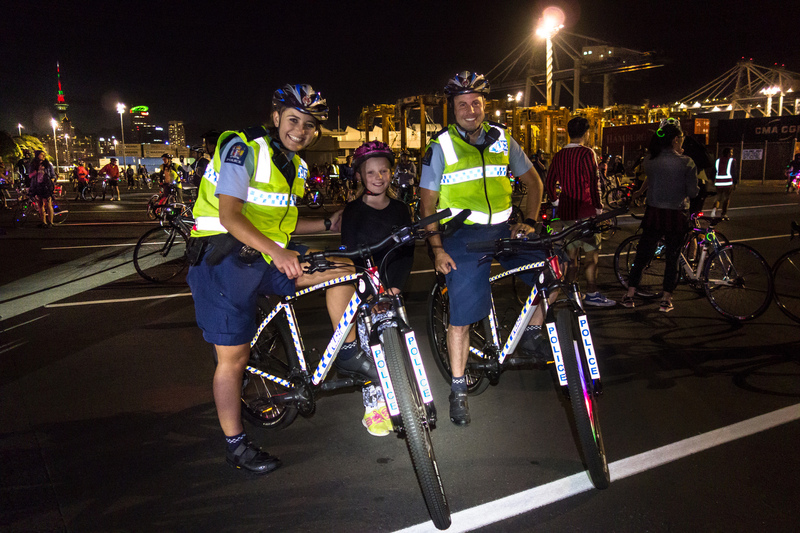 The third instalment of Bike Rave came and went on Saturday night and a good time was had by all. 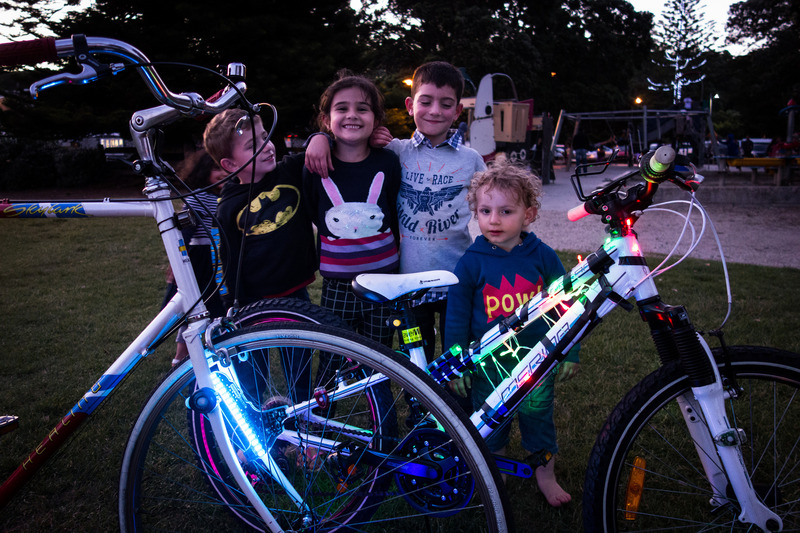 Like last time I had my nine year old in-tow, and although the crowd is predominantly twenty-somethings, Bike Rave is super family-friendly. We didn’t feel out of place, in fact there were a bunch of kids riding, even one on a mini fat-bike, it was sooooo cute! Speaking of cute, check-out the crew in the last photo. Waiting for the sun to set at the Mission Bay start, these little fellas ditched the nearby playground and buzzed around our lights like moths to a flame. My daughter and I ended up riding in circles on the grass as they ran behind shrieking with delight. That’s bike-advocacy at work right there! Chopper [tick], Big Sound-System [tick], Disco-Lights [tick]. WIN, WIN, WIN!!! The Boy & Girl in Blue. They were awesome! The Velociteers doing their thing on Queens Wharf. Bike Rave Groupies at the Mission Bay start. 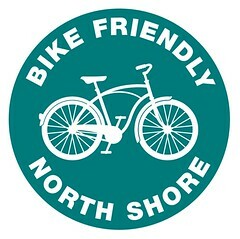 Bike Rave now has a web-page, so bookmark that, friend them on FaceBook, and get along to the next one! 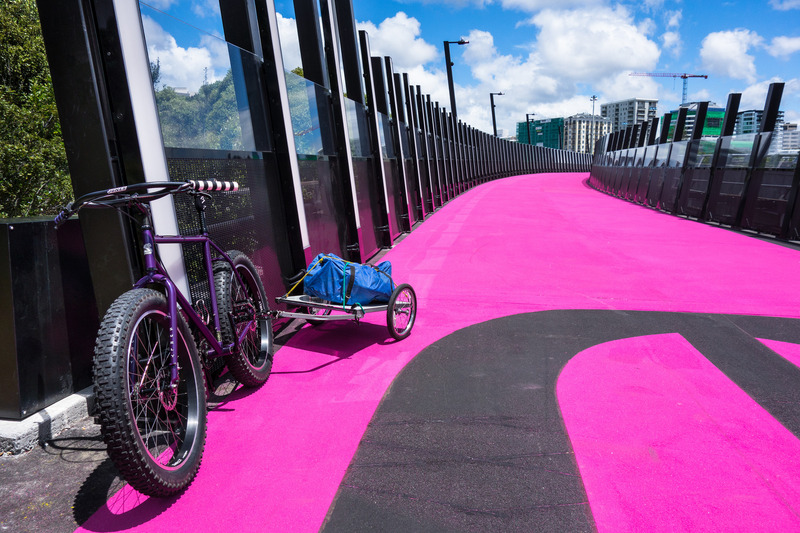 Join Bike Auckland (formally Cycle Action Auckland) and friends to christen Auckland’s latest world-class cycleway next week. I believe the ribbon-cutting/speeches/fall-asleep-standing-up part is in the morning. 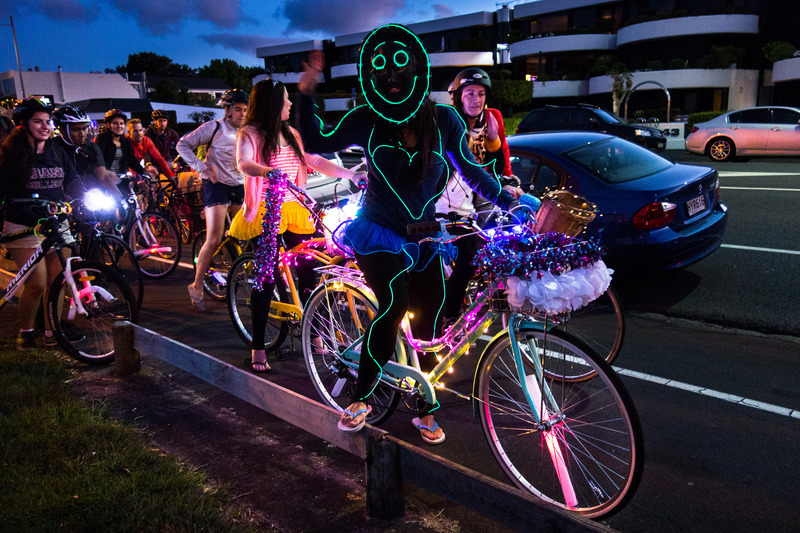 This is simply a casual ride that evening with fellow cyclists as the sun sets and the multi-coloured lighting fires-up for the first time. 700m long, lit by LED wonder-lights, surfaced with pink fairy-dust and suspended high above Spaghetti Junction, this is one impressive ribbon of concrete & steel. It’s the type of fast, convenient, safe infrastructure Auckland needs to get people moving under their own steam. What progress we’ve made, remember the fuss when the Takapuna to Devonport cycle lanes were put in? That was a mere strip of green paint (Leprechaun-Dust?) and the tin-top brigade thought the sky was falling-in. The Nelson Street path utilises a mothballed section of motorway, but it didn’t come cheap, and yet we barely heard a peep? Times are changing and I like it! Sunset @ 8.24pm, Lights On!